The wind-up radio was created by famed inventor Trevor Baylis in the late 80s/early 90s. It was originally created to help educate the people of Africa about AIDS in an effort to stop it from spreading so rapidly. Since then, the wind-up radio has become a popular and well-known invention, as well as one that has not only evolved, but is still in use today. Today, it is commonly used by those who are hiking in remote areas as well as people who enjoy survivalist camping and just want something that will keep them updated on local weather conditions and similar happenings. They can be powered using a simple hand crank, and many are also able to generate electricity using solar energy, which is incredibly kind on the environment. It’s a great piece of tech to have on you when you are out exploring, and one that really was able to spark a lot of change within the industry. You’re not alone in the process though, because we know how tricky it can be to choose the right item for your situation. In order to help you find the best wind-up radio, we have put this guide together, compiling all of the relevant wind-up radio reviews in one place, allowing you to find the perfect one for the next big adventure. How Does a Wind-Up Radio Work? The majority of electric generators will require a spinning motor in order to produce any electricity. When you wind the hand crank, the copper rotor begins to spin and the electricity generated through that. As the rotor turns inside the radio, it is actually spinning inside a magnetic field, and it is this fixed magnetic field that is responsible for the generation of electricity, which works in accordance with Faraday’s Law of Induction. The electricity that is generated by the spinning rotor is sent from the winding mechanism to the individual components of the radio via brushes that are attached to an electrical load. The electricity generated by this is used in the circuitry that makes up the radio, which then spread the electricity to the necessary components within it, allowing the radio to pick up a signal and emit sound through the speaker. 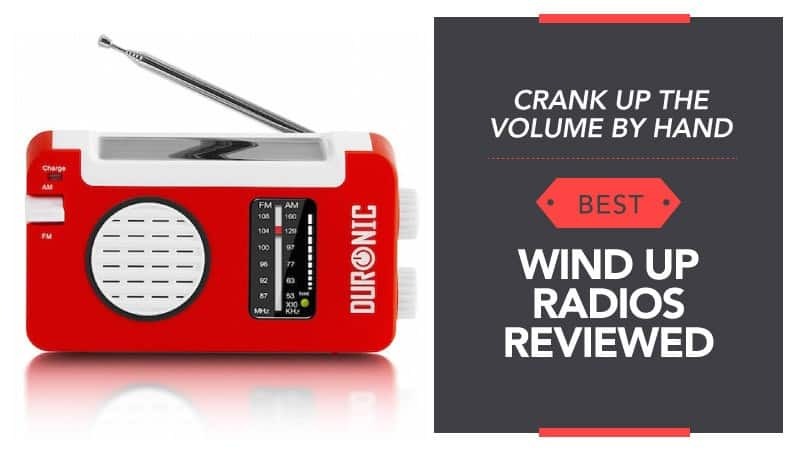 Now that you know a little more about the benefits of having one around, check out the wind-up radio reviews below and see what you think. Solar power is one of the best ways to power your devices and help the planet to heal a little in the process. Duronic is a good brand to go for if you are in search of something trustworthy and reliable, so it might be worth taking a few minutes to read the reviews below and see what you think of this. 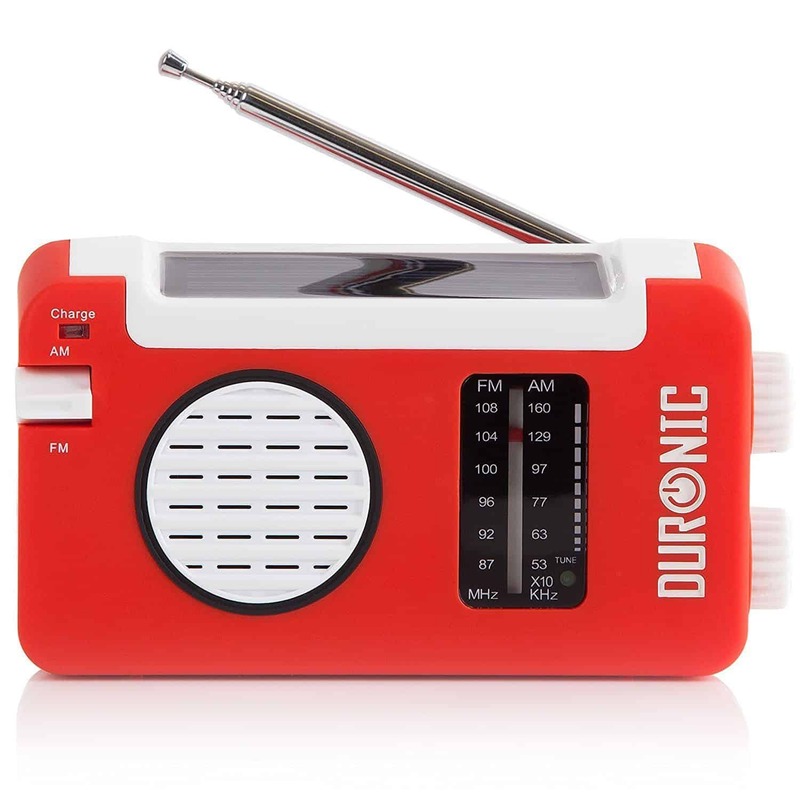 This wind-up radio comes in a flashy shade of red with white detailing, giving you a retro design that will stand out in all the right ways. It’s also incredibly small and lightweight, weighing in at a mere 200g, so you can slide it on your pocket or your rucksack and take it with you on every adventure. Even the antennae slide back in nicely to create a really neat little package that you are sure to love. It is solar powered and can be wound up by hand, but also comes with a rechargeable battery if you come across a power source and need a quick boost. There is a headphone jack on the back that allows for private listening, and the sound quality is surprisingly good considering the small size and low price. It’s also able to catch radio signal really well, so you can listen wherever you are. Some customers have found that it can be a little fiddly and flimsy. 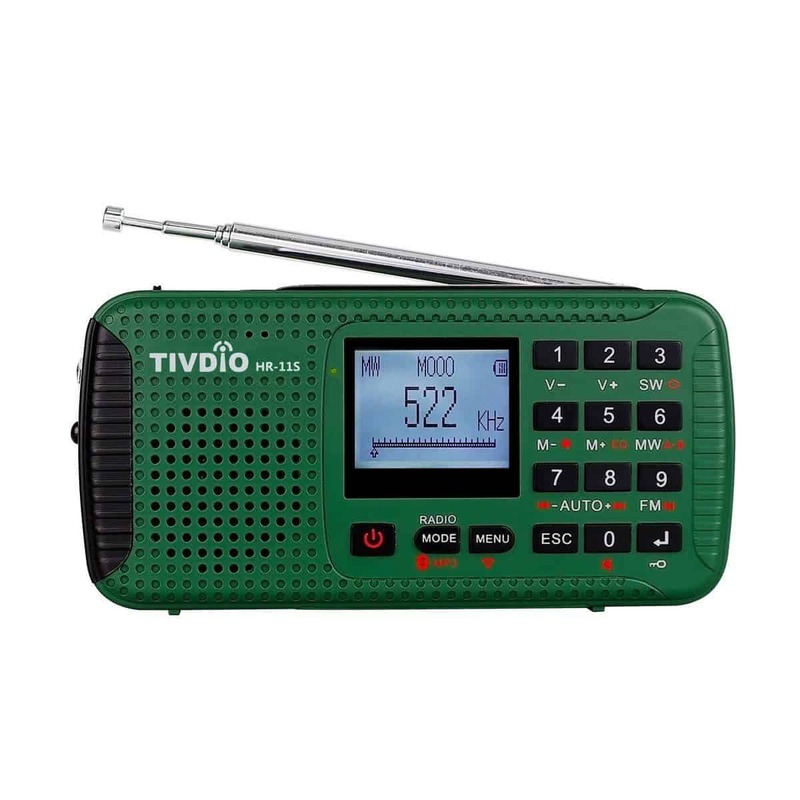 This is a great little wind-up radio, and it comes at a fantastic price that can slot perfectly into practically any budget. While some customers have found that it is a little fiddly and flimsy, it still offers really good sound considering the size, and a handy range of features that allow you to listen just the way you want to. Overall, it really does make for a good device, and the fact that you can charge it using solar power is a massive bonus. Once again, we are looking at the solar radios for an option that is easy as well as friendly towards the environment. Semlos is another good brand to look at, and you might find yourself surprised by how much it can offer you. Just read below and see what it can do to improve your next trip. This wind-up radio has a really cool design, and definitely looks like something you would take with you when hiking or camping. Plus, it is bright orange, so it isn’t going to get lost easily either. It is also really lightweight and portable, sliding easily into your pocket or backpack while you are walking to make transportation that much easier – and you will barely even feel it when you are moving. There are four different ways to charge it, ensuring that you always have power when you need it. 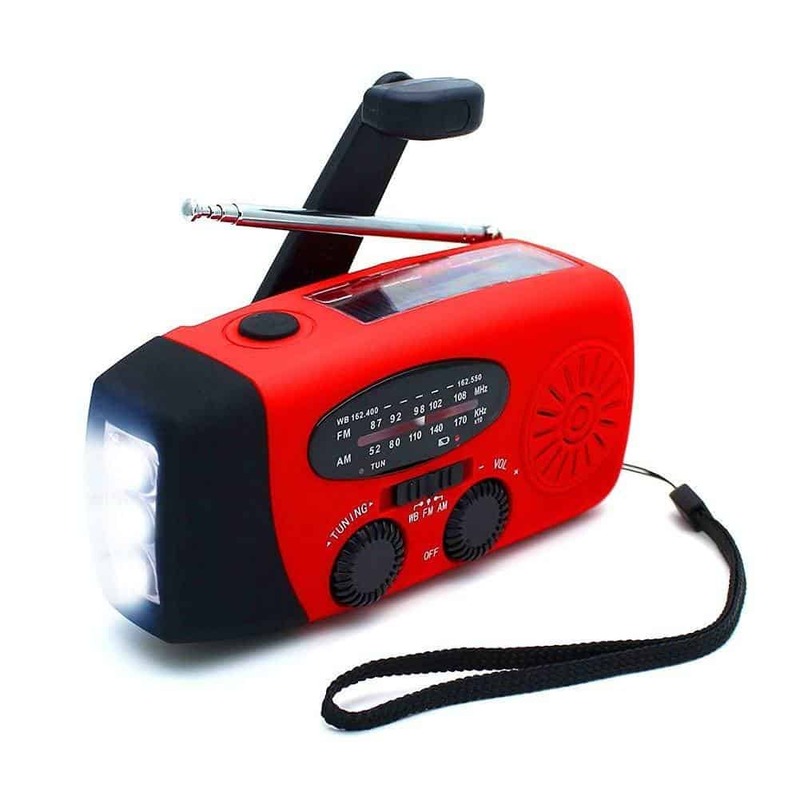 You can use solar power, hand cranking, batteries, or the micro USB port, each of which will provide you with the power you need to access the AM and FM radio stations. You can even use it as a torch, which is really bright, and it can last for up to eight hours in this mode, perfect for emergencies. Some customers found that it was a little more fragile than they would have expected. 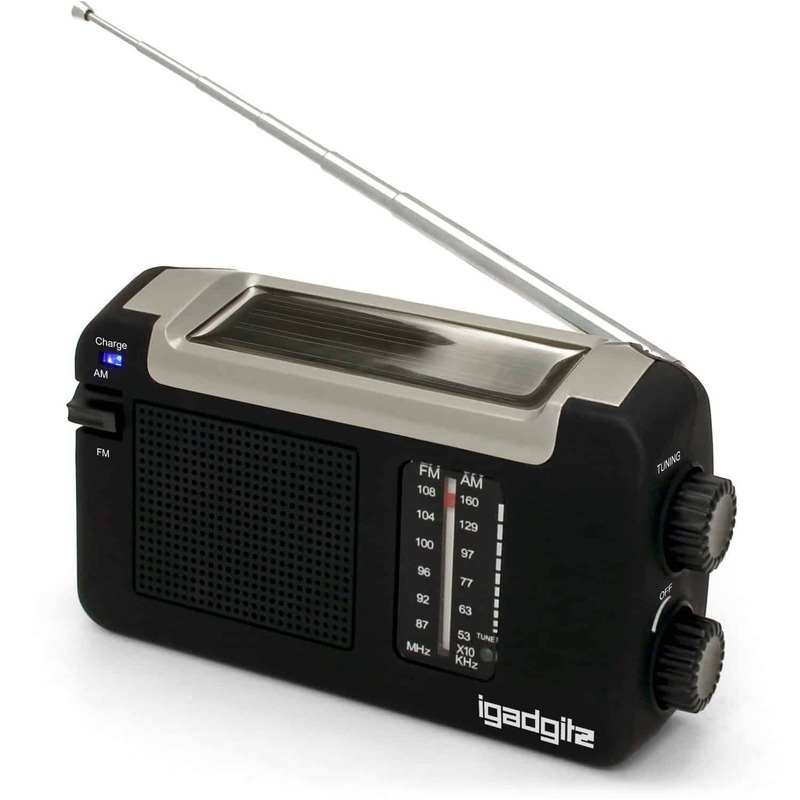 This wind-up radio comes at a really good price, and one that is ideal for those who are on a budget and looking to spend a little less on something that is good quality. While there are those who felt that it was a little flimsy when compared to other models, it really does hold its own in terms of versatility and sound quality, making it both a cheap and practical piece of kit to have with you when you are out and about. Plus, there are four different ways to charge it which is always useful to have. 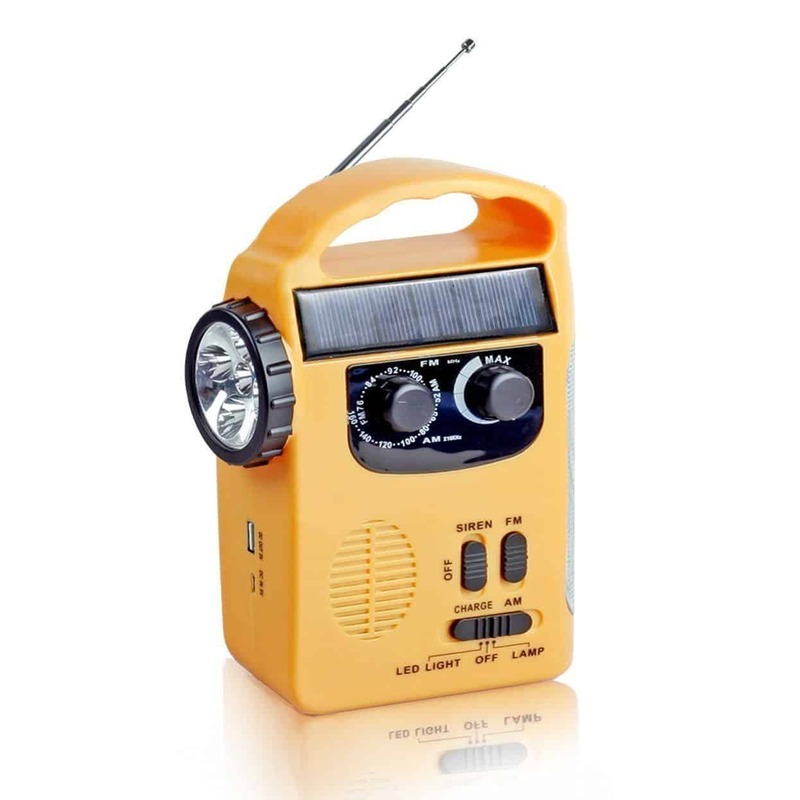 If you are searching for a solar wind-up radio that also offers you excellent value for money, then you are in luck with this great little model. It has everything you need in one neat package, and you may just find that it’s everything you were searching for. This wind-up radio comes in black with white and silver detailing, and also has a brilliantly classic design that you are sure to love. It is pocket-sized, sliding nicely into just about any coat or backpack with ease, and the lightweight build means that you will barely notice it as you walk around. The aerial is also easy to slide back into place, ensuring that everything can be carried around neatly. It can be charged using solar power if you want something really eco-friendly, but there is also the choice to wind it up by hand as well as use rechargeable batteries if you find yourself in a real bind. There is even a USB power cable if you find somewhere with electricity, and you may be surprised by the quality of sound that comes from it (it’s pretty good). Durable and reliable, it’s a sturdy little piece of kit. A few customers have found that you do need to be in a very clear area if you want to get a good signal. This wind-up radio comes at a really good, budget, price that will leave you both impressed and satisfied with your purchase – especially as it does what it says on the tin. While some have noted that the reception isn’t always good, it generally does a superb job of finding stations and playing them back to you. Plus, the sound quality is surprisingly good, which is something you don’t commonly find with radios that are this size. Overall, it makes for a brilliant choice for anyone who is going away for a day or two. Here are some further models of wind-up radio, just in case the ones above do not quite meet your requirements. This nifty little wind-up radio is incredibly compact and lightweight, making it the ideal portable solution for anyone who is out and about and would like to listen to some music or shows. After only five minutes of cranking, you are rewarded with an excellent 20 minutes of radio, perfect for falling asleep or taking a break while you eat. However, you also have the option of charging it using solar power if you want to save some energy. It keeps you updated when it comes to the latest weather, hazards, and emergencies in the area, so you always know what is happening, and it also doubles up as both a flashlight and a power bank for those unexpected emergencies. All of this comes at a great price, and one that you will feel quite pleased with. This wind-up radio isn’t just lightweight, it’s also multi-functional and small enough to slide into practically any pocket. It is the ideal companion for those who are hiking or camping, and can act as the perfect form of communication with the outside world when you are taking time away – ensuring you are kept updated on the weather or any emergency situations. You can charge it using solar energy, the hand crank, or even via a USB port, it all depends on your situation. It can be used to charge your phone or record memos that you need to make as you go. There is also an alarm, sleep timer, and an MP3 player that can take a micro SD card packed into this little wonder. Considering everything this little box of tech is capable of, the price is pretty amazing too. Hopefully, this guide has helped you to find the best wind-up radio, and that it has given you a little assistance when it comes to figuring out how they can work with your life, as well as the trips you take – whether it’s survival camping or just a long hike. The radios we have gathered here are predominantly solar powered, although many of them have alternative powering such as a hand crank or even a USB port. However, while they are all very similar, there are plenty of differences which is why we can’t pick just one of these to be the best – they are all top of the line, which is why they are here. We have made sure to include a range of prices that will suit most budgets comfortably, as well as a selection of brands that are reliable, and some that have been selected as the top names by Amazon. Regardless of your choice, one of these wind-up radios is going to be perfect for you. What did you think of our wind-up radio guide? Are there any that you would have liked to see or recommended? We love hearing from you, so make sure to leave us a message in the comments below.